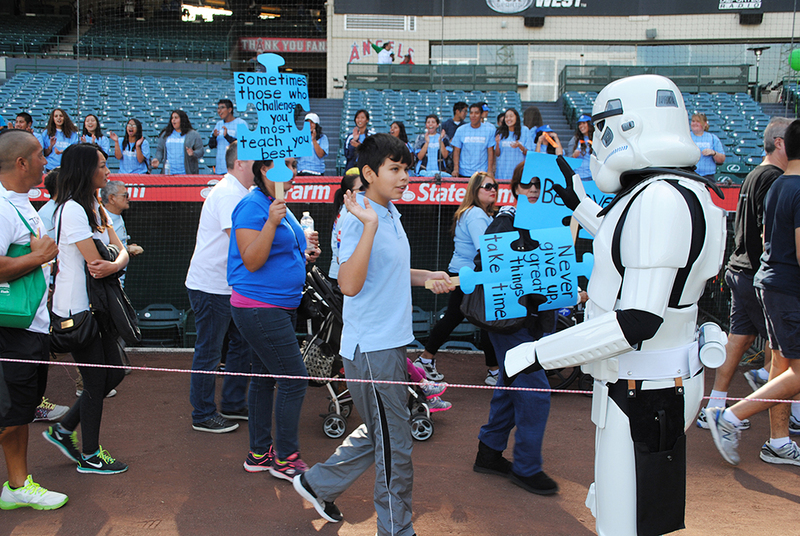 Southern California, Orange County Squad, 501st Legion shows their support at Walk Now for Autism Speaks' event. 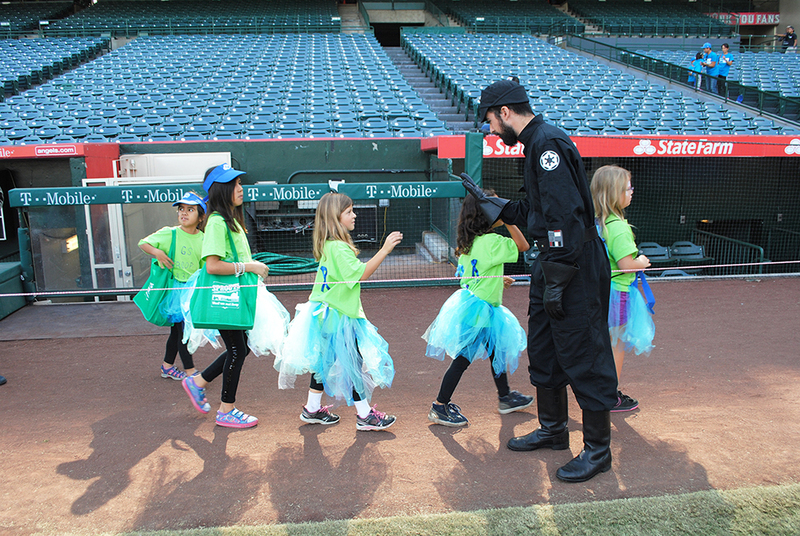 Nothing but smiles gleamed off the attendee’s faces at the 2015 12th Annual Walk Now for Autism Speaks event at Angel Stadium on Sunday. 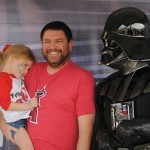 Who knew the Dark Side of The Force would brighten the day of so many people? 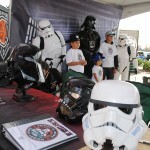 The Southern California Garrison, Orange Country Squad, 501st Legion had the honor of trooping the event. 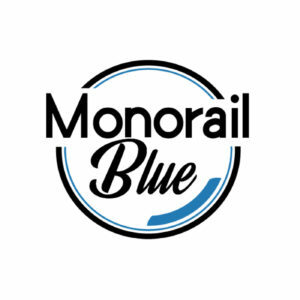 The all-volunteer based organization proudly contributes to their community though charity and fundraising events. 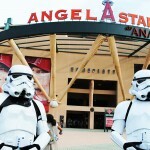 Stormtroopers, Biker Scouts, TIE Pilots and other members of the Galactic Empire invaded Angel Stadium and impressed families with their friendly and welcoming candor. Walk Now for Autism Speaks is a 5K walk and autism resource fair. Autism Speaks is the nation’s largest advocacy program. This fun-filled family event is the nation’s largest grassroots autism walk program and the signature fundraising and awareness affair. 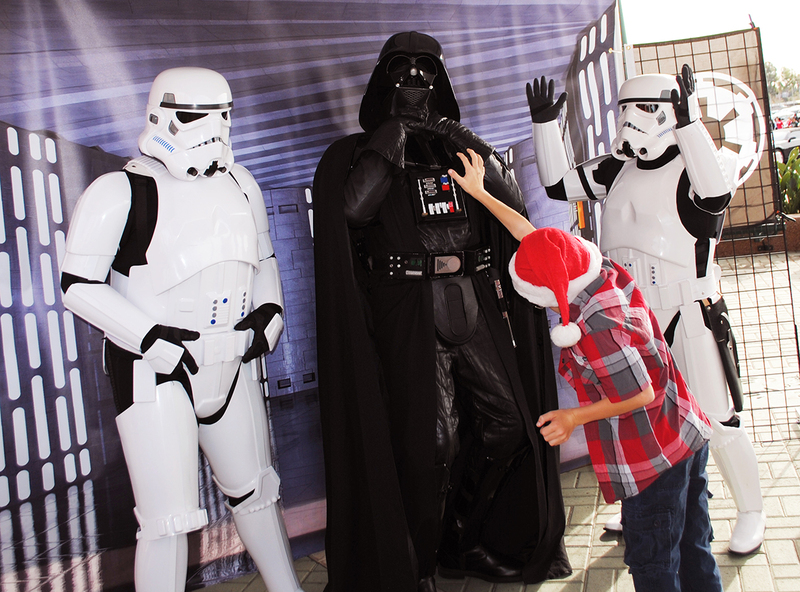 Hosting over 8,500 guests, the 501st Legion was thrilled to be invited and immediately accepted. 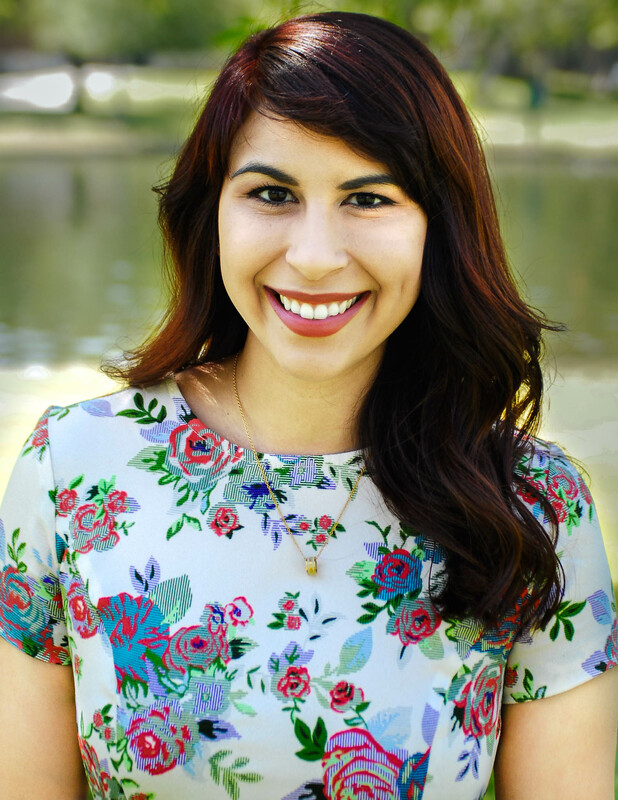 Attending and fundraising for the 2015 Walk Now for Autism Speaks Orange County 5K Walk and Autism Resource Fair enables our organization to fund and serve individuals living with Autism Spectrum Disorder support through our Mission and it’s four pillars including Science, Advocacy, Awareness, Family Programs and Services. Supporting this Walk supports at both a National and local level and brings our Orange County together. As we all love Star Wars and our children are drawn towards these characters, we are thrilled to have their presence and support on Walk Day! 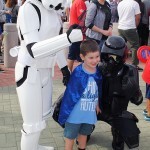 Knowing the complexity of this disorder that has varying behaviors, the 501st was able to lend a helping hand with the autistic guests who were more timid to approach them or have patience for those wanting multiple photos. A Biker Scout stopped for a lightsaber duel with a guest. A Shadow Scout sat with a young boy who just wanted to admire his gear. Darth Vader lifted and carried an attendee who was scared of his height. This group excelled beyond any volunteer work because they knew who the real heroes were—the supporters and families there, walking with loved ones and encouraging hope for all. 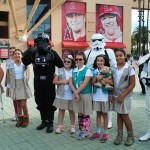 The 501st were there to show their support and cheer on groups walking the stadium. One of the ways to show their support was to stand on the sidelines of the walk and applaud registered walkers. 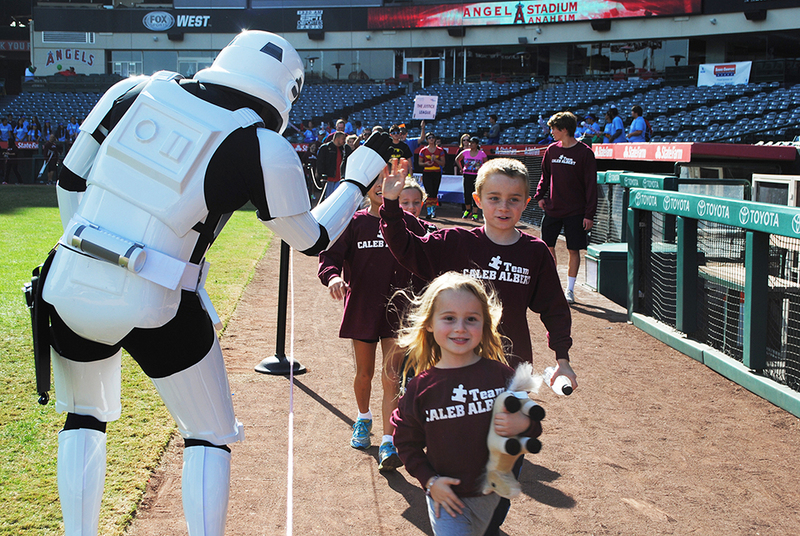 Giving high fives, fist pumps, and selfies along the 5K walk, the 501st tallied along the rope lines. 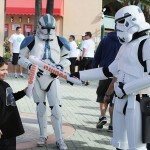 The Walk Now for Autism Speaks event is exactly what the 501st is about; doing our small part to help a great cause. The Orange County Squad of the Southern California Garrison would like to make this our ‘signature’ event on an annual basis. Not only because we believe in it, but one our members has a son with autism, so it is very personal to him and to all of us that support. “Bad Guys Who Do Good” is their slogan and it is definitely one they stand for. Autism Speaks raised over $218 K on Sunday and will continue to flourish each year. 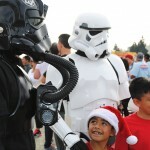 The 501st will too continue to do their part in participating, help raise funds, raise awareness, and more importantly-support the causes they feel passionately about. 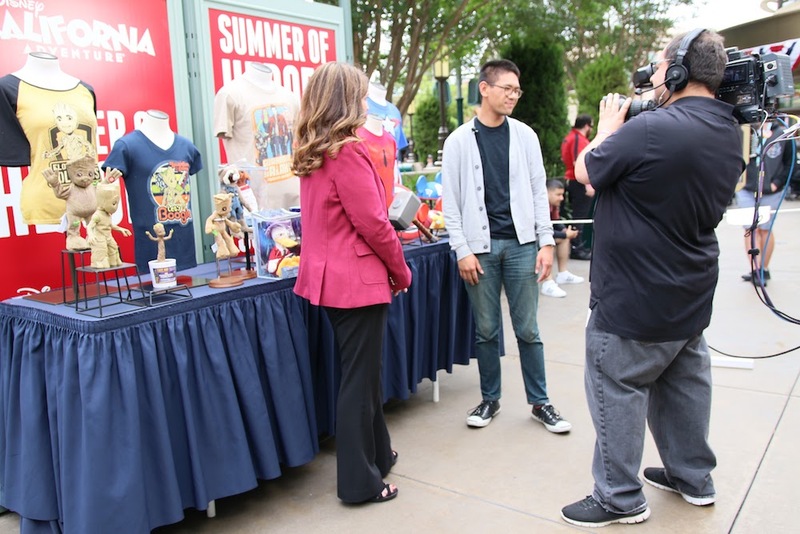 Previous story Take a look inside Walt Disney’s newly restored office suite.